Tilajari Resort hotel is located less than 30 minutes from the volcano and its lake. The hotel offers 32 deluxe suites, 40 standard rooms and 4 family connected rooms, bar, restaurant, swimming pools, gift shop, sport facilities, botanical garden, butterfly garden, conference rooms and many other services, spread over on 17 hectares along the banks of the San Carlos River. All hotel rooms are equipped with air conditioning, ceiling fan, TV via satellite, hot water, direct dial telephone, safety deposit box and terrace. 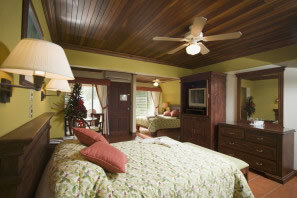 Plus DVD, coffee maker set, mini-bar, sitting area and queen size beds in our deluxe suites. 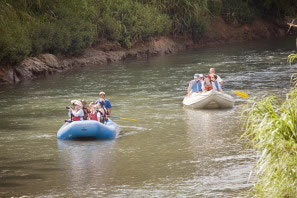 Activities at Tilajari Resort abound! There are three lit tennis courts, a soccer field, two racquetball courts, a basketball/ volleyball court, gift shop, conference room, horseback riding, mountain bikes, kayaks, a private butterfly farm, private 1,000 acres of tropical rain forest, and 25 acres of groomed lawns, gardens and fruit trees. Also, many tour options are available. 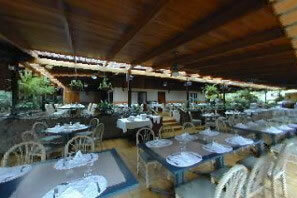 Their restaurant offers the best of the international cuisine as well typical Costa Rican dishes. Their chef has worked for some of the finest hotels in San Carlos and will gladly prepare your favorite dish, while you are having a tropical drink, and enjoying the rich variety of birds and flowers around our open air restaurant.